Dreams are a doorway to the other side; they offer a glimpse of what lies beyond this world and into ourselves. A person who’s dreaming usually exists in the workings of the mind, in a model of the subconscious, but without a body, without the things of the ordinary world to pull awareness back to reality. 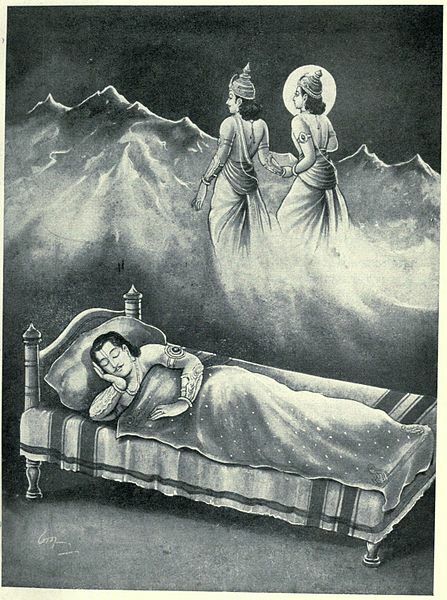 Krishna teaches his disciple Arjuna out of his body, while he is sleeping. When we’re sleeping, we’re not just in the body dreaming, but we’re out of the body, and when we come back from a dream the body that we’ve been in (the astral body) comes back into this one, so it’s all locked together. Being aware of falling back into the body just before waking up and sleep paralysis, where if you wake up and you can’t move, or sleep blindness, where you wake up and you can’t see, are all examples of how we experience part of the transition between the two worlds. In sleep paralysis the body is immobilized to stop us walking in our sleep, because we’d be enacting dreams and running about and doing all sorts of things if the body didn’t do that. So if you come back to it after sleep but you haven’t quite woken up, you’ll feel the effects of that immobilization as you’re not quite fully connected with the physical body and can’t move it. It’s more than your body going through a process to keep you safe though because you’re aware too that you’re not quite in your body and you can sense it, and you may wonder where you are and what’s going on. If you can manage to get up at that moment you can actually get up in your astral body and leave your physical one behind. This is a natural process of sleep; having dreams and out-of-body experiences are a natural process of sleep. It’s just that they can’t really be explored using conventional scientific techniques, because when a sleeping person is studied only the sleeping body can be studied, or in the case of near-death experiences, a body which is dead, and so what the person is experiencing can’t really be reached. So you then, you’re left with having to explore it for yourself. As we’re falling asleep, we are actually passing into another dimension. People who have near-death experiences sometimes see that dimension very clearly. But when someone is dreaming they don’t normally see it; they see mostly the model or projection from the subconscious. But as we’re falling asleep we’re in a transition period between dreaming and being awake, and we’re partly in that realm. That’s when we can feel the different stages of the transition out of the body and can consciously project out of it. Occasionally if you’re in that transition period, you can pick up on and hear and sense things from that plane as though they’re happening in the three-dimensional world, even though you may feel that you haven’t yet fallen asleep. 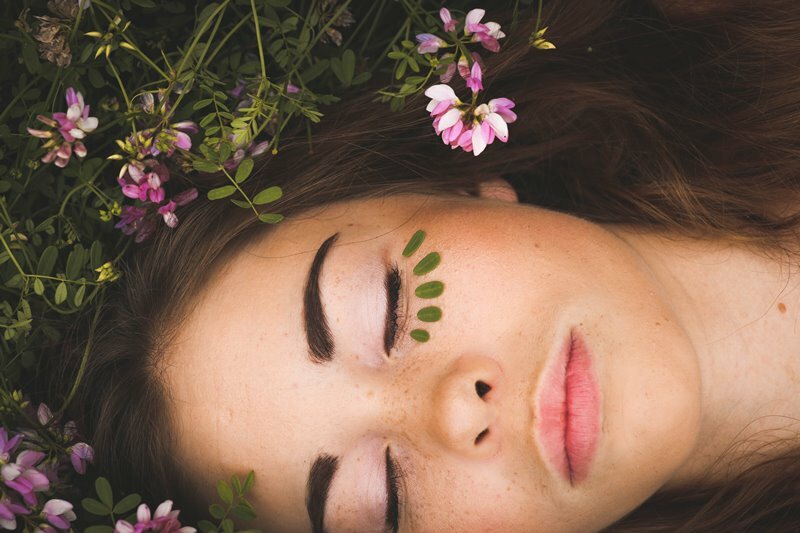 What happens while awake influences what is dreamt about all the time. What goes on in thoughts and emotions during the day is then played out at night. You can influence it by looking into your thoughts and emotions during the day and changing them. So if you become a bit calmer for instance, then you’re going to have a bit of a calmer night. If you get agitated or nervous – if an event happens that has strong emotions attached to it such as a job interview or similar– it’ll come out in dreams at night as well. So you can assess yourself by seeing what you do in our dreams. Everyone also gets in touch with or are influenced by things from outside of themselves. So sometimes it is possible to get information from outside one’s own self created model dream world. Very occasionally, for example, we can get a premonition that someone is going to fall ill and it turns out to be true. These things happen quite a lot – there’s no scientific explanation for them, but they do happen and so commonly that they couldn’t be a mere coincidence. It’s not all created by the mind; there is something more going on. Events happen in that plane before they happen here and that’s how we get premonitions of them. They just manifest in the three-dimensional world slightly later. All kinds of teachings and learning goes on in dreams. If you look into ancient scriptures and mythology you’ll see that they used to be the main avenue of communication between people and the divine. They would refer to dreams for information and guidance from spiritual realms. This is our most ancient form of dream use, which we are fortunately still able to use today. Having teachings in dreams throws up very interesting questions. If for example you can get guidance, then who is guiding you? If guidance is from other beings, where are they? Where do they come from and what relationship do they have with your dreams? There are so many scientifically unexplainable phenomena in dreams. There are different kinds of dreams – spiritual, mundane, premonitions, dreams from the subconscious or symbolic. Symbolism is the language of the astral plane. It’s different from the language we use here, but it’s universal and common symbols can be found across diverse cultures throughout history. That’s why you see so many symbols in religious pictures and in mythology. You can gradually learn the language of this symbolism and can slowly understand things in dreams and out-of-body experiences. Many dreams though do come from the subconscious and are incoherent, crazy repetitions of what the mind produces here in daily life. These are influenced by the various emotional states or egos, which then pollute the inner world and manifest in thoughts and images. They then become real in that dimension, in dreams, and so conscious awareness becomes lost in their scenes. Events from daily life get played out without three-dimensional reality to bring the dreamer back, so the subconscious runs riot as what’s inside the subconscious mind, when awake in this dimension, is given free reign over there. There’s no one to stop you, there are no neighbors, colleagues or friends looking at you saying, “You’re acting a bit strange.” Over there, what is thought and felt becomes as though it’s real. Respectable people here act like crazy people over there. You can get information about how you really are not just from looking and observing here in daily life, but also looking at your dreams and there are exercises you can do to help to remember them. It’s very useful to look back over the night’s dreams to see what different inner states or egos you can see, and see what you’re doing over there, because that really is the state of your psyche. Without the conventions of everyday life, that’s what you really are. Each of us who comes here is given a physical body. With it learning is possible and the opportunity to elevate ourselves and become spiritual, or just to stay like animals. What each of us brings with us to this life can be seen in dreams. When a person leaves this life, they take all that with them – that’s what is taken to eternity; we’re given this life to learn and to change. Q: Can we get information from dreams about what we were doing before we were born and other important things? Belsebuub: Yes, in dreams you can get information about a lot of things, including your existence before you were born. You can also get information as to what it is that you most need to correct here. If you see a negative state for example that is constantly repeating, then it’s showing that you need to work here to change that negative state. Symbols have many different meanings, even for the same symbol, so you have to use intuition and to look into your life and see what needs to change. But you can be sure if you see yourself with a certain emotion in your dreams that it’s something you need to change. So is this your main line of work – to study sleep and dreams? Not really – it’s to study esoteric knowledge, which is the study of everything that’s inside of us. But rather than studying it from an external point of view as a psychologist would, it’s to study it from a personal point of view. For example, if you want to know what anger is like, then you could get accounts of people explaining what it’s like, or measure the body when it’s angry, but you won’t really get to the feeling of anger. To know what anger is within yourself, you simply see it, observing it as you’re feeling the emotion and in that way you explore your psyche – you perceive what emotions feel like, how they arise, in what sort of circumstances; it’s a deeper way to learn about ourselves than with conventional psychology.